On January 17, 2018, the B.C. 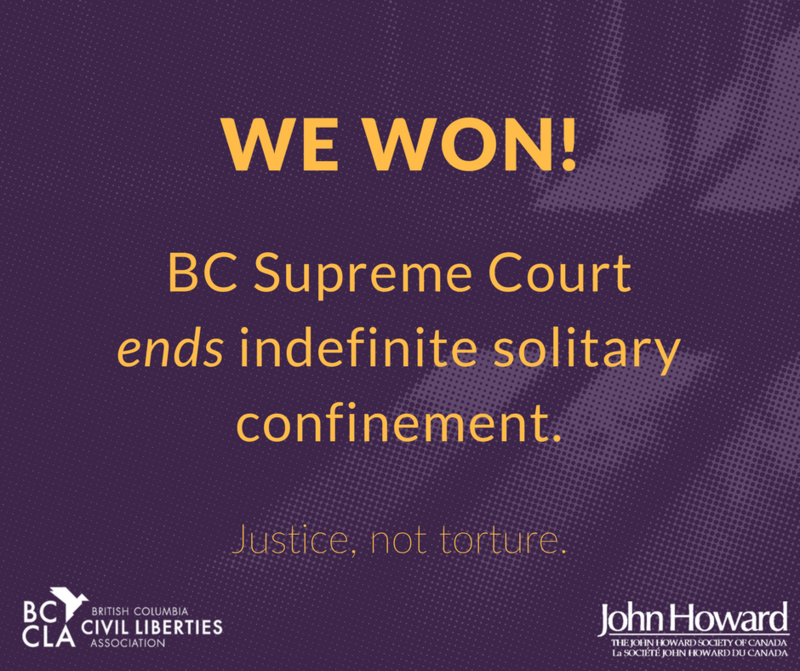 Supreme Court issued its decision in BCCLA and JHSC v. Attorney General of Canada, 2018 BCSC 62. The Court declared that the sections of the Corrections and Conditional Release Act (“CCRA”) that allow for indefinite solitary confinement (referred to as “administrative segregation” in the legislation) are of no force or effect. The Court held that the laws violate s. 7 of the Charter of Rights and Freedoms in that they permit prolonged, indefinite solitary confinement, fail to provide an independent review of segregation placements and deprive prisoners of the right to counsel at segregation review hearings. The Court further held that the laws violate s. 15 of the Charter to the extent that the laws authorize any period of administrative segregation for the mentally ill or disabled, and to the degree that the regime discriminates against Indigenous prisoners. Relying on evidence from lay witnesses, including correctional staff and prisoners who had experienced solitary confinement, as well as evidence from a dozen experts, the Court found that solitary confinement places prisoners at significant risk of serious psychological harm, including mental pain and suffering, and increased risk of self-harm and suicide. The Court determined that the laws allowing for solitary confinement were overbroad because prolonged segregation not only harms prisoners, it ultimately undermines institutional security. The Court further concluded that the laws authorize solitary confinement in circumstances where some lesser form of restriction would achieve the legislative objective of security of the institution. With respect to reviews of segregation placements, the Court disagreed with a recent decision by the Ontario Superior Court which held that additional reviews could be conducted by the prison service itself. 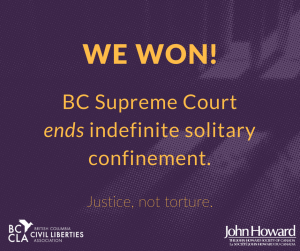 The BC court held that segregation placements must be reviewed independently by a decision-maker who is not an employee of the Correctional Service, and who has the authority to release an prisoners from segregation. The Court also found that prisoners are constitutionally entitled to have a lawyer at segregation review hearings. In considering the equality protections of s. 15 of the Charter, the Court held that the laws permitting solitary confinement fail to respond to the needs of Indigenous prisoners and those prisoners with mental illness or disability. The Court concluded that the laws instead have the effect of reinforcing, perpetuating or exacerbating the disadvantage of those prisoners. As a result, these laws are discriminatory and violate the Charter on this additional basis. Perhaps most importantly, the Court concluded that a constitutional scheme of prisoner segregation must include time limits. A time limit on the use of administrative segregation is necessary to compel the prison service to move quickly to get prisoners out of segregation. Time limits would “create the pressure to ensure that decisions about alleviating an prisoner’s segregation were made and implemented promptly, while still allowing CSC to use the practice for short periods to address security concerns.” The Court described a 15 day time limit as a “generous” though “defensible” standard. Read the full decision from the court here.